As 2016 comes to a close, we want to pay special tribute to those who passed away this year from the world of soap operas, including beloved creators, writers, performers and executives. Watch our tribute below. Best known for playing iconic villain Stefano DiMera on NBC soap opera Days of our Lives, Mascolo's other daytime roles included Ed Lucas in Where the Heart Is, Jack Lander on From These Roots, Carlos Alvarez in Santa Barbara, Nicholas Van Buren (Domino) on General Hospital, and Massimo Marone in The Bold and the Beautiful, in addition to playing a cop on The Doctors. D'Incecco served as casting director for ABC soap operas All My Children and One Life to Life, working over 20 years for the network. She was best known for casting Susan Lucci as Erica Kane on All My Children. When she received her Emmy for the role in 1999, Lucci thanked D'Incecco, calling her "the legendary casting director, who saw me as more than just an ethnic type and saw that I could play Erica Kane." Mundy's roles on daytime soap operas included Eugenia Von Voynavitch on All My Children, Isabelle Alden in Loving, Mona Croft on The Doctors, and Julia Stoddard in The Guiding Light. Mundy received a Daytime Emmy Award nomination in 1982 in the Outstanding Supporting Actress category for her work on The Doctors. Addabbo's soap opera roles included Jim Lemay on Guiding Light (1999-2000), Tony 'Rush' Carrera in The Bold and the Beautiful (1997-1998), and Jason Craig on Generations (1989-1991). He also stepped in as a temporary replacement for Michael Nader's Dimitri Marick on All My Children in 2001. McBride played mostly small parts before landing the leading role of Meg Dale on the CBS soap opera Love of Life. The series revolved around sisters Vanessa and Meg, with Jean starring opposite Peggy McCay in the original 1951 cast. Famous for her headscarf and curlers in the role of Hilda Ogden, Alexander spent 23 years on British soap opera Coronation Street as the archetypal working class Northern woman. The character was hard-edged busybody but furiously house-proud, particularly of the flying duck ornaments which adorned a mural - or "muriel", as Hilda told guests - in her front room. Westmoreland, who also went by the stage name Rad Fulton, appeared in The Monroes (as Ruel Jaxon in 1966-67), General Hospital (as Teddy Holmes in 1972), and The Young and the Restless (as Decker in 1982). DeHaven's soap opera roles included Bess Shelby on daytime drama Ryan's Hope, and Annie Wylie in the syndicated Mary Hartman, Mary Hartman. She also portrayed Emma Mallory on All My Children, Sara Fuller in As the World Turns, and made a guest appearance as Gloria Marlowe on primetime sudser Falcon Crest. The Morocco-born star appeared in numerous television series, including General Hospital, Alias and Ray Donovan. Best known for her long-running role as Corabeth Godsey on CBS drama The Waltons, Edwards also appeared in primetime soap operas Dallas, Falcon Crest and Dynasty. Sumner's Australian soap opera credits included Neighbours (as Ewan O'Brien), Heartbreak High (as Les Bailey) and Home and Away (as Edward Dunglass Snr.). Thicke appeared in numerous television shows, including 7th Heaven, The L.A. Complex and This Is Us. He also played talk show host Rich Ginger on CBS soap opera The Bold and the Beautiful. In 1981, Gabor guest-starred on the CBS daytime soap opera As the World Turns. She played Lydia Marlowe, sister to Miranda Marlowe (Elaine Princi). Drummond's first break into television came in 1967 when she landed the role of Nurse Jackson on the ABC soap opera Dark Shadows. Drummond later appeared on other soaps including CBS' As the World Turns and Love is a Many Splendored Thing. Her only starring daytime role came as Loretta Jardin on CBS sudser Where the Heart Is. British soap fans will also remember Sachs for his memorable stints in both Coronation Street and EastEnders. In 2008, Sachs played Ramsay Leonard Clegg, the half brother of Corrie stalwart Norris Cole. In 2015, he appeared in EastEnders as Cyril, a patient on the same ward as Stan Carter. Known best for appearance in several Our Gang comedies, Tuckers credits included a stint on CBS radio soap opera Hilltop House (1939-1940) as Roy Barry. The Man From U.N.C.L.E. star also appeared in Emerald Point N.A.S. (as Harlan Adams), As the World Turns (as Rick Hamlin), One Life to Live (as Bishop Corrington) and Coronation Street (as Milton Fanshaw). The Brady Bunch star reprised her iconic role as Carol Brady numerous times over the years, including in the 1990 CBS primetime soap opera The Bradys. In 1981, Jenner appeared in several episodes of CBS primetime soap opera Knots Landing as Jeff Cunningham, Abby's (Donna Mills) ex-husband. He later had a recurring role as Dr. Jerry Kenderson on Dallas (1984–1986). In Daytime, under Short's executive leadership, Procter & Gamble became one of the world's largest suppliers of television entertainment with shows such as Search for Tomorrow, Guiding Light, As the World Turns, The Edge of Night, Another World, Texas, Somerset and From These Roots. Paton was best known for her portrayal of Mrs. Lancaster in the 1993 film Groundhog Day. She had 91 film and television credits, nearly all of them after she was in her late 50s, including a 6-episode run as Harriet Anderson on CBS primetime soap opera Falcon Crest. She also appeared in Grey's Anatomy, ER, L.A. Law and NYPD Blue. In 1980, La Rosa was nominated for a Daytime Emmy Award for his work in the recurring role of Reynaldo on NBC soap opera Another World. Grundy's production company created many of Australia's biggest TV shows, including The Young Doctors and Prisoner, called Prisoner: Cell Block H elsewhere. He developed soap opera Neighbours in the 1980s with head of drama Reg Watson. A WWE favorite, Chyna was named the “Rookie of the Year" for the Women's Championship in 1996. Devereux played the role of Sid Perks in British radio soap opera The Archers for nearly 47 years. He landed the role of teenage tearaway Sid in September 1963, and the character later went on to become the landlord of The Bull pub, and remained on the show until the Sid's death in 2010. Siller played Reverend Esther Warren on British soap opera Coronation Street. She also appeared as Leona in BBC drama Casualty and Marilyn Dingle on Emmerdale. The Everybody Loves Raymond star's TV credits included an Emmy winning 1982 guest stint on St. Elsewhere, and appearances in primetime serials Mary Hartman, Mary Hartman, Soap, Grey's Anatomy and Desperate Housewives. From 1964-1966, Michaels appeared on CBS daytime soap opera As the World Turns as Tom "Tommy" Hughes. He also played the character in the primetime spinoff, Our Private World. Bull memorably played Tess Krakauer Prentiss Randolph on CBS soap opera Love of Life, where she starred opposite future real life husband Gene Bua, who played Bill Prentiss. In 1976, Toni joined Gene on NBC's Somerset, where she played Denny Saunders. Warren was a 24-year-old actor when he had the idea for the Coronation Street television series, set on a working-class street in northwestern England where he had grown up. He wrote the initial 13-episode run, which led the network to picking up the show. Corrie is currently the longest running television soap opera currently on the air. The Cool Hand Luke actor starred as Carter McKay, J.R. Ewing's business rival, in the final seasons of primetime soap opera Dallas. In 1968, he joined the cast of ABC's original Dark Shadows series where he played the characters of Nicholas Blair, Evan Hanley and Charles Dawson. In 1970, he split his time between Dark Shadows and Another World, where he played interior designer Joe Bruno. His other soap work included roles on The Edge of Night (Mayor Finley), One Life to Live (Bruno Weston), Love of Life (Dr. Applegate), Loving (James Preston), Guiding Light, Somerset, Texas and For Richer, for Poorer. Drake earned Emmys in 1988 and 1989 for playing office worker Benny on L.A. Law. His TV credits included the primetime dramas Firefly, Six Feet Under, Prey and 7th Heaven. Plowright was most widely known for her role as the hairdresser Julie Cooper on British soap opera EastEnders, in which she appeared regularly for nine months in 1989-1990. The Rockford Files star appeared on NBC daytime soap opera Santa Barbara in 1990 as Cy Agnew, a friend of Phyllis Blake. Irving won a Tony Award in 1973 as Best Featured Actor in a Musical in "Irene" opposite Debbie Reynolds. In 1981, Irving guest-starred for several episodes on ABC daytime soap opera Ryan's Hope in the role of Forrest Turner. The Dallas-born Noble had extensive credits before Benson, including playing Grayling Dennis on the CBS daytime soap opera The bBrighter Day, and remained on the network to play Vic Price in The Edge of Night, and Don Hughes in As the World Turns. He went on to play Dr. Edward Sims on ABC's A World Apart, Dr. Bill Winters in NBC's The Doctors and Dr. Morris in ABC's One Life to Live. In June 1977, Noble appeared on NBC's Another World as Reverend Harris, who performed the wedding ceremony for Alice Matthews Frame and Ray Gordon. Serving as SAG-AFTRA President when he died, Howard had a distinguished career which included roles as Garrett Boydston on Dynasty and The Colbys, and George Summers on The Young and the Restless. Hamner created two long-running CBS dramas, The Waltons in the 1970s and Falcon Crest in the 1980s. 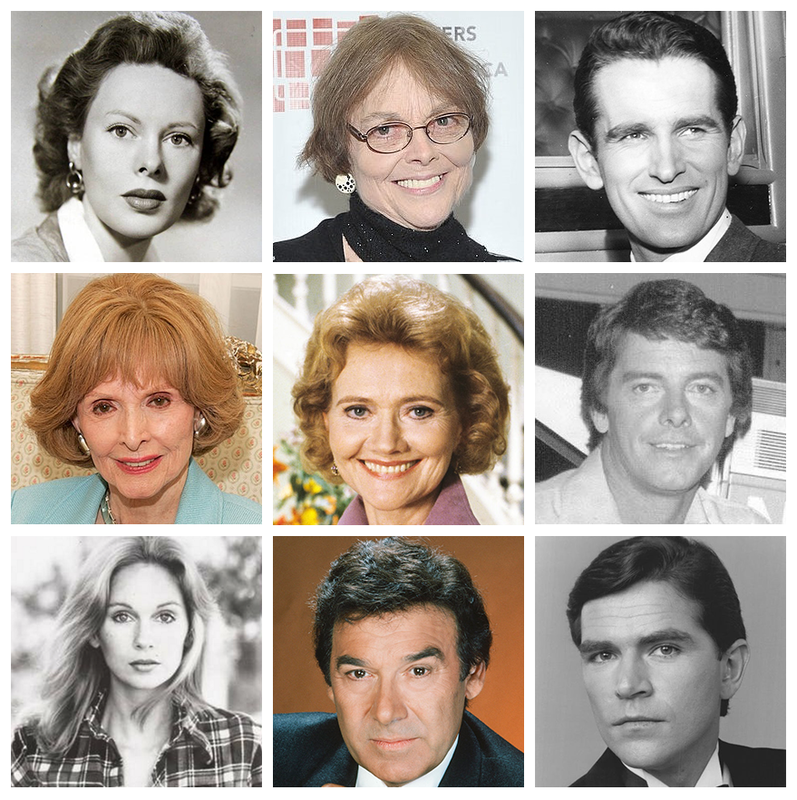 Brown's soap opera roles included Dr. Greg Peters in Days of our Lives, Charles Sanders III on One Life to Live, Robert Laurence on The Young and the Restless, and Blake Hayes in The Bold and the Beautiful. He also played a doctor on Generations, and Tom Flintoff in an episode ofwhit Dallas. The Wagon Train star played Lisa's husband, Whit McColl, for two years on CBS soap opera As the World Turns in the early 1980s. Anderson, the iconic voice behind the Lucky Charms leprechaun, played Buddy on radio serial Tony and Gus in 1935 when he was only 12 years old. The Tony-winning "Hairspray" actor also played Noel Douglas on ABC soap opera The Edge of Night in the mid 1970s, and Neil Hayes on One Life to Live in the 1990s. On daytime television, the Petticoat Junction actor played Lennie Small on The Edge of Night, Norman Garrison in As the World Turns, Brandon Kingsley on All My Children, and Dr. Royal Dunning in Another World. Among Tarbuck's many televisions credits were roles on ABC soap opera General Hospital (as Jane Jacks), NBC's Santa Barbara (as Sister Allegra), CBS's Falcon Crest (as Dr. Randall), ABC's Dynasty (as Dr. Holt), CBS' Dallas (as Agnes) and FX' American Horror Story (as Mother Superior Claudia). Some of Duke's earliest acting roles were in daytime soap operas. In the late 1950s, she played Ellen Williams Dennis in CBS' The Brighter Day, and appeared as Molly Scharf in NBC's Kitty Foyle. Barry made her daytime debut in 1954 in NBC soap opera First Love, starring as Laurie James, and continued to work on various daytime dramas until the 1990s. Her many suds roles included Addie Horton Williams on Days of our Lives; Viola Brewster in For Richer, For Poorer; Peg English ("The Cobra") on All My Children; "Miss Sally" Gleason in Guiding Light; and Isabelle Alden on Loving. Labine wass best known for co-creating ABC daytime soap opera Ryan's Hope 1975, and her writing stints at General Hospital, One Life to Live, Guiding Light, Where the Heart Is and Love of Life. Malloy was the go-to leading man on daytime soap operas in the 1980s, starring as Schuyler Whitney/Jefferson Brown in The Edge of Night, Kyle Sampson on Guiding Light, and Travis Montgomery in All My Children. He also appeared in the final episode of Search for Tomorrow, and later played Clay Alden in Loving and Dr. Weston on As the World Turns. Often termed the "queen" of contemporary soap opera, Nixon was best known, and most honored, for introducing social issues into the soaps. She first wrote for the CBS daytime drama Search for Tomorrow in the 1950s, then learned her craft under the tutelage of Irna Phillips. In the early 1960s, in her first head writing job, with The Guiding Light, she had the heroine, Bert Bauer (Charita Bauer), develop uterine cancer. Nixon then became head writer of Another World (1965-1967), creating the character of Rachel Davis (played by Robin Strasser). The real beginning for the presentation of issues in television soap opera, however, was the first show Agnes Nixon created, One Life to Live (1968), written for ABC. Nixon's success allowed her to bring her "dream" soap to the network, All My Children, which premiered in 1970. Nixon also drew on the religious and mystical. One of her favorite tales is from the third soap opera she created (with the late Douglas Marland), Loving (ABC, 1983; later The City).